Long-time Congregation Beth Israel member and employee Joy Alkalay z"l, passed away in 2014. 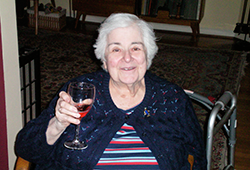 It was after her death that the congregation learned that Joy had generously left a legacy gift of more than $1 million to create a permanent endowment fund at OJCF to support CBI, Jewish Federation of Greater Portland and Jewish Federations of North America for support of the State of Israel. According to Joy's dear friend Pierce Ethier, "She was one of a kind. Joy was an incredibly strong willed person. And she was very proud to not only be a Jew but a supporter of Israel. And, she wanted to support our local community, as evidenced by her legacy gift."